Pâte sucrée is incredibly easy to make. Even easier to make than pie dough. The reason is that this dough is basically a giant shortbread cookie. All the flour is coated in butter first and then a tiny bit of egg is used to hold it all together. Resulting in a tender, buttery, flaky crust that is the perfect base for fruit tarts and can be used as an almond free substitution for almond sablé which is used in the cream tart recipe. 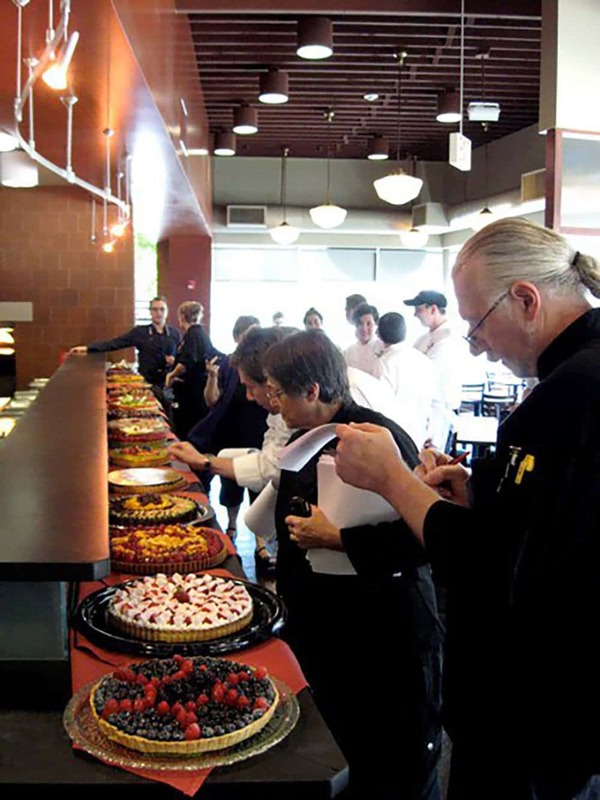 When I was in pastry school at OCI, every year there was a fruit tart competition. It was so fun to see the different variations on something that seems so simple. Pâte sucrée (tart dough), pastry cream and fresh fruit. Boy oh boy was I wrong! There were dozens of variations. Not only was the pastry cream flavored in different ways but sometimes replaced all-together with lemon curds or mascarpone filling. Fruit toppings ranged from berries to exotic fruits. The variations are endless. I always thought making a tart was pretty strait-forward. Add in your (room temp) egg and vanilla and let mix until smooth. Press dough down slightly so it’s not a ball. This makes it easier to roll out later. Wrap in plastic wrap and chill at least two hours before using. But that’s just the beginning. Tarts where not just judged on how tender and flaky they were. They were also judged on even-ness of browning, how thin the Pâte sucrée was, how even it was on the sides and bottom, how level the top of the dough was and how well it was baked. Here are my tips on how to make the perfect Pâte sucrée, step-by-step as taught by my pastry chefs. By no means do I think I am an expert in tart making but I can pass what I have learned and get you started. After you chill your dough, you’ll need to let it warm up a little before you use it. Think about the butter in the tart dough. It just came out of the fridge so it’s very hard but after an hour or so, it will be softer. You don’t want your tart dough to be SUPER soft, just pliable enough to roll out. Before you start rolling out your Pâte sucrée, dust your surface with a light coating of flour and rub your rolling pin with some flour to keep the dough from sticking. The type of rolling pin you use does not matter as long as it’s flat. Pâte sucrée should be rolled to 1/8″ thick. This can take practice and often times you will accidentally make the center of the dough thicker than the edges, resulting in uneven baking. A trick to help you is to put two 1/8″ wooden dowels on either side of your dough and use it as a guide for how thick to roll out your dough. Only roll out as much dough as you need for one tart. Begin by evenly rolling out your dough and moving it on the floured surface frequently to prevent sticking. If the dough does stick just lift it up and toss some flour under there. You might notice the edges of your dough cracking as you roll it out, don’t worry too much about it and just press the cracks back together as you roll. I prefer a tart pan with a removable bottom. That way you can see the beautiful edges of the tart after baking. The removable bottom also makes it easy to take the crust out of the tin. Gently roll your dough onto the rolling pin or lift with your hands and place into the tart tin. Press down into the tin without thinning out the dough. Press the sides of the dough into the ridges of the tin (gently) to prevent the dough from sliding down. Repair any cracks in the dough. 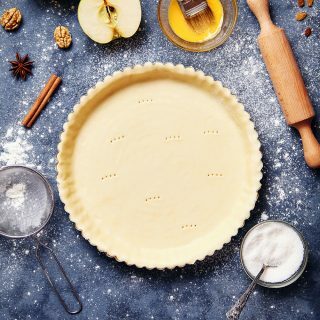 Use your rolling pin to roll over the surface of the tin to cut off the dough or you can use a paring knife to cut off the excess evenly. Leftover dough can be re-used for another tart. Freeze the dough for 30 minutes or refrigerate for an hour to firm up that butter again. When you make a fruit tart, you have to bake your tart shell first and let it cool before filling with pastry cream. This is called blind baking. After your dough is chilled, poke the surface of bottom of the dough with a fork. This helps air release from under the tart dough and prefents bubbles from forming. Cover the surface with a piece of aluminum foil. Press the foil into the corners and along the sides to keep the dough from puffing while baking. Fill the tart all the way to the top with raw rice or pie weights. After 15 minutes, check to see if the foil is releasing from the dough. If it’s sticking then it needs to be baked for longer. Check every 2 minutes. Once the foil is able to release from the side, take the tart shell out of the oven. Place the tart back into the oven and bake for another 10 minutes until the edges just begin to turn a golden brown. Once the tart is cool, you can remove the outer ring by gently lifting up from the bottom of the tin. You can serve your tart on the base or you can gently remove it from the base by separating it with a paring knife. There is a risk of breakage when you do this though so I tend to not risk it and just serve it on the base. Always fill your tart right before you’re going to serve it. Pasty cream, curd or any other filling is going to cause the tart shell to soften and get soggy after a few hours. If you want to make your tart ahead of time (more than a few hours before consuming) it’s best to brush the tart shell with a thin layer of chocolate using a pastry brush to keep the crust from getting soggy. Plus it tastes so yummy! Then you can fill the tart with pastry cream, pudding, curd or whatever you want. Top with fresh fruits or berries. We always glazed our fruits with fruit glaze made by thinning down apricot jam and brushing it onto the surface of the fruit. The fruit glaze also makes the fruit stay fresh and looking beautiful. Pâte sucrée is very easy to store. Leftover dough can be kept in the fridge for a week or frozen for 6 months. If you have the freezer space, it’s actually really great to make your tart ahead of time, wrap it in plastic wrap put it in the freezer until you need to bake it. A great time-saving tip for those last minute desserts. 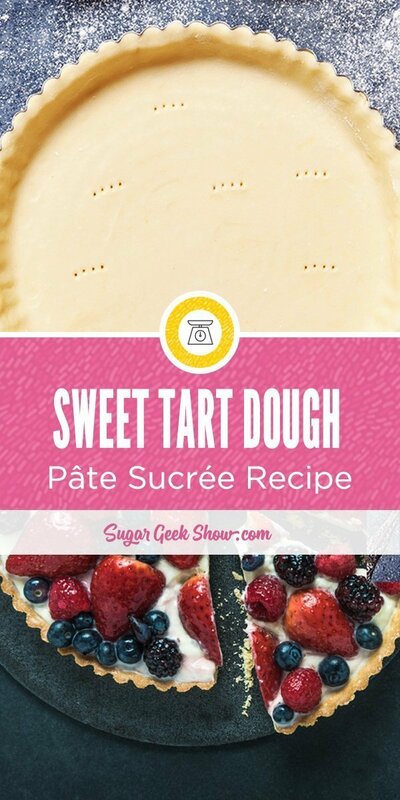 Pâte sucrée is a sweet shortcrust that is often used to make fruit tarts. It is buttery, flaky and oh-so-easy to make. This recipe makes enough dough for FOUR 8" round tarts. Freeze leftover dough. 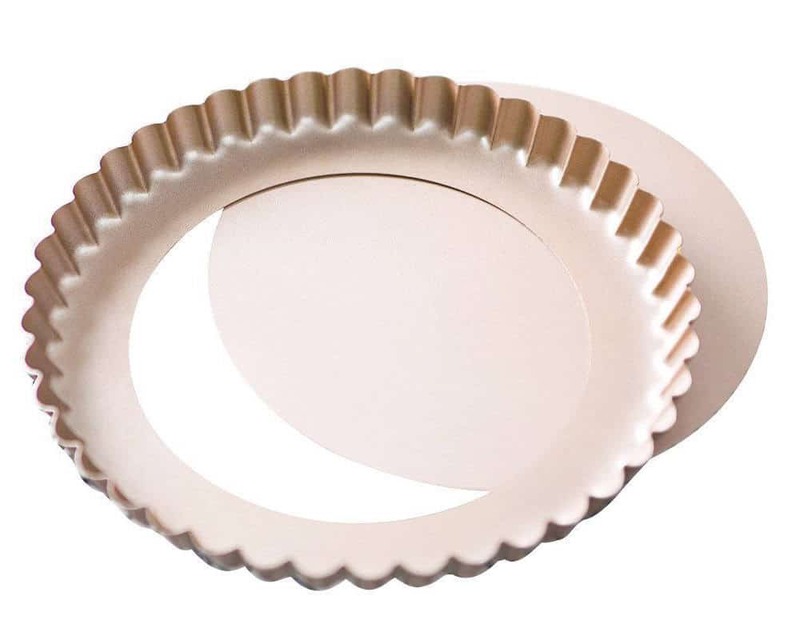 Yes this is tart dough so you can definitely use it to make mini tarts 😀 Poke a few holes in the bottom of the tart with a fork and bake for 10-15 minutes until the edges begin to turn golden, then let cool fully before filling.